A 2016 Canadian documentary and a new investigative report recommend academic institutions sever ties with their Confucius Institutes. WASHINGTON—Since 2004, China has been funding Confucius Institutes (CI), language programs under the communist regime’s Ministry of Education that form partnerships with American universities. In the United States, the CI is a multibillion-dollar enterprise, with branches on campuses across the country. But the question remains: Does the China regime just want to promote Chinese culture, or is there something more insidious about its intentions? In recent years, faculty at universities that host CI have often voiced concerns about their campus branch having been established in secrecy, being beyond local faculty control, and competing with their modern language program. The CI program is managed and funded by China’s Office of Chinese Languages Council International, usually called the Hanban, which falls under the country’s Ministry of Education. The faculty at the University of Chicago objected to allowing an external party to hire and train teachers, as well as the university’s ties to the Hanban. Several scholars of China have written books and articles critical of the program. They’ve asked about the intellectual costs of an arrangement that grants significant authority to a party outside the university, allowing it to hire, train, and pay its own staff in line with the priorities of the Chinese regime—including its constraints on free speech and belief. In 2014, the University of Chicago closed its institute after five years. The faculty at the university objected to allowing an external party to hire and train teachers, as well as the university’s ties to the Hanban. To better understand the role of Confucius Institutes in American higher education, the author of the report, Rachelle Peterson, who is director of research projects at NAS, examined 12 Confucius Institutes, including two in New Jersey and 10 in New York. 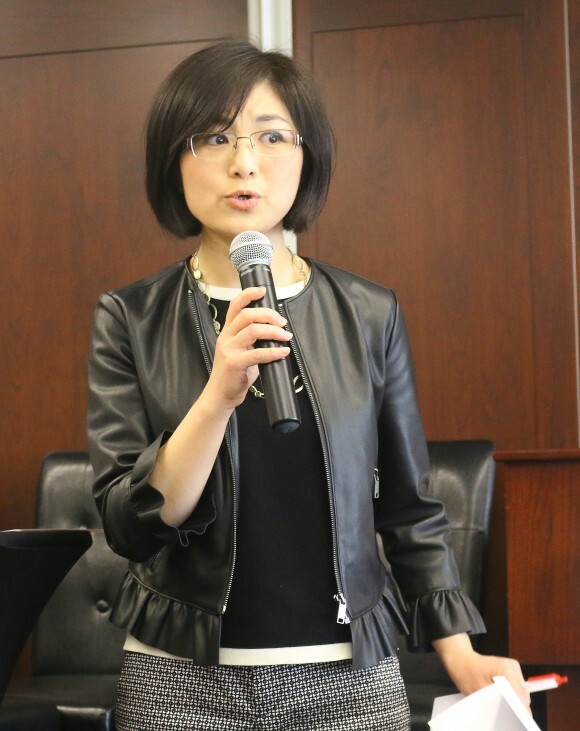 Conducting the research was challenging, said Peterson, who presented her findings at an event hosted by Alliance Defending Freedom on April 26. Most of the CIs she studied were not very forthcoming and, in some instances, were openly hostile to her research. Peterson was joined by Doris Liu, director and producer of the documentary “In the Name of Confucius.” The film reenacts the personal story of former CI Mandarin teacher and Falun Gong practitioner Sonia Zhao, who exposed secrets of the CI program that led to the first closure of a Confucius Institute in North America. The film also profiles contentious scenes taken at Canada’s largest school board, the Toronto District School Board (TDSB), as it debated the CI program, including public protests in Canada for and against CIs. Hanban runs 103 Confucius Institutes in the United States, with the majority operating out of universities. It also operates more than 500 Confucius Classrooms programs at primary and secondary schools in the United States. These U.S. programs represent 38 percent—the most in any country—of China’s 1,579 Confucius Institutes and Classrooms worldwide. Other countries with high numbers of these education outposts are the United Kingdom, Australia, Italy, South Korea, Thailand, Germany, Russia, Japan, and France. China’s overseas investment in Confucius programs is growing. In the United States, the number increased 35 percent in the last year. In her research, Peterson found that Chinese teachers at CI felt pressured to avoid certain topics that are censored in China, such as the Tiananmen Square massacre, Tibet, Taiwan, Falun Gong, and criticism of Communist Party legitimacy. The teachers, who report to the Hanban, lack formal academic freedom, states Peterson. Even while working in America, they can be fired for openly discussing topics censored in China. Some CI instructors told Peterson that if the subject of Tiananmen Square came up, they would describe its beautiful architecture, avoiding any discussion of the 1989 student massacre. Liu said that Canada’s McMaster University told a Tibetan student not to show a Tibetan flag at an annual activity celebrating the various nationalities on campus. Liu determined that the request originated from the director of the CI on campus, who asked the activity coordinator to tell the Tibetan student not to show the flag. Peterson wrote that local observers at North Carolina State University said that the Confucius Institute was responsible for rescinding an invitation to the Dali Lama to speak on campus in 2009. In 2008, Israel’s Tel Aviv University shut down a student display about the treatment of Falun Gong adherents in China. The students sued, and the court found that the university had acted under pressure from a dean who feared harming the university’s relationship with CI. Some American professors told Peterson that they felt pressured to self-censor. A good example of the way self-censorship works was given by Julie Wang, Binghamton University’s Asian and Asian American studies librarian. The lesson she learned in this episode and others was to avoid conflict: “I self-censored,” she said, noting that university faculty regularly works with the Hanban and she didn’t want to make it “awkward” for them. 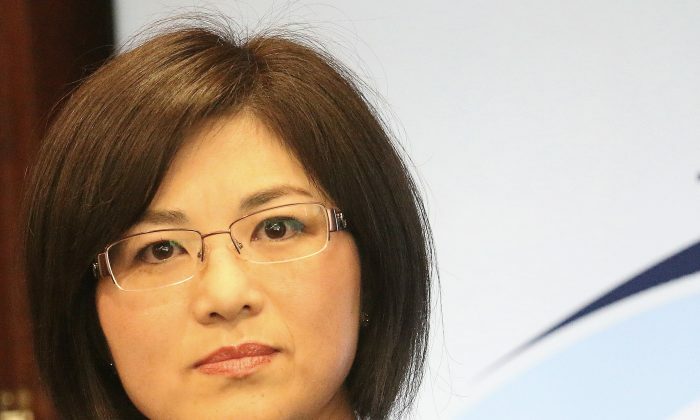 In 2011, Sonia Zhao, who was an instructor at the CI at McMaster University, told McMaster authorities that she had been coerced into signing Hanban’s contract, which stipulates that employees are not allowed to practice Falun Gong. The moment Zhao was presented with the contract, she felt it was too late to back out, according to Liu’s documentary. Zhao said felt pressured and feared persecution if she admitted to her spiritual practice by refusing to sign the contract. Her mother had been imprisoned in China for two years for being a practitioner. Falun Gong was a popular spiritual practice that was suppressed China in 1999 out of the communist leadership’s concern that it threatened loyalty to the Chinese Communist Party. The adherents have been especially targeted by the regime, which detains hundreds of thousands of practitioners and subjects them to various tortures, leading to death in a number of cases. Researchers say that the regime has killed Falun Gong practitioners by harvesting their organs to fuel the country’s lucrative transplant industry. McMaster University, which is a public research university located in Ontario, Canada, found this hiring discrimination that excludes Falun Gong adherents as unacceptable, and subsequently terminated their relationship with the Hanban and closed its Confucius Institute. None of the 12 Confucius Institutes Peterson examined would disclose their contract with the Hanban or its funding arrangements. None of the 12 Confucius Institutes Peterson examined would disclose their contract with the Hanban or its funding arrangements. NAS had to file requests under Freedom of Information Law in New York and New Jersey in order to obtain the contracts from eight of the public universities among the 12 in the group studied. In general, with notable exceptions, there was evasiveness and sometimes hostility toward the inquiries Peterson made for the NAS report. Only at two of the 12 institutes did the director agree to meet with her. The CI director at Binghamton University agreed to a meeting, and wrote her to “feel free to let me know if you need any assistance in your visit,” but suddenly canceled two days later, and also canceled the meeting Peterson had scheduled with members of the CI staff. Nor would the latter respond to follow-up requests for comment. When Peterson arrived at the Institute, she found it locked with the lights off. That this situation was very unusual was indicated by a CI board member who expressed surprise that the CI was closed. In the report, Peterson raises the concern that American universities are becoming financially dependent on China. “Typically, new Confucian Institutes receive $150,000 in start-up funds from the Hanban, and $100,000 in subsequent years,” she wrote. The Hanban also typically pays and houses each of the teachers. However, the number of Chinese students coming to a university and the extensive relationships that it has in China would be jeopardized if the CI were closed. “Several of the Confucian Institutes contracts we examined included plans for student and faculty exchanges, scholarships for American students to study in China, and other incentives,” wrote Peterson, in the report. CI plays a key role in attracting full tuition-paying Chinese students, which appeals to universities in search of income, writes Peterson. She cites figures from the Institute of International Education that show that the number of Chinese students enrolled in the United States during the 2015–16 school year—328,547—was a 525 percent increase from 2005–06. Chinese students currently make up more than 30 percent of all foreign students in the United States. 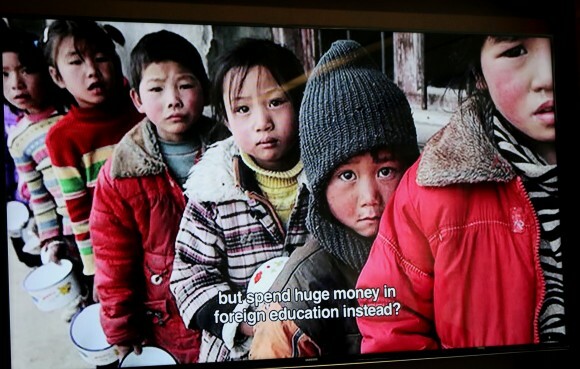 Liu’s documentary, using photos of impoverished children in very primitive schools in rural China, questions the motivation of the China communist regime in spending billions of dollars annually to educate people overseas. 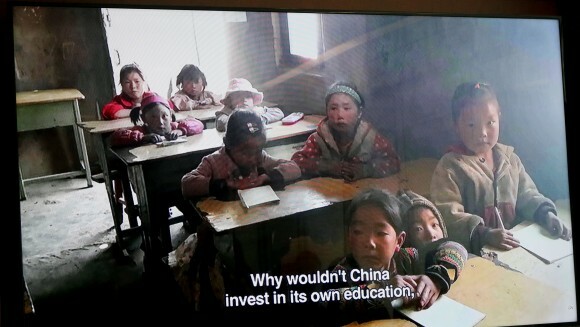 Screen shots from the documentary, “In the Name of Confucius,” a Mark Media production. It shows children in rural China who would benefit from the money the government spends abroad on Confucius Institutes and Confucius Classes. Liu said that on the Confucius Institute online class, an animated video refers to the Korean War as “the War to Resist US Aggression and Aid Korea.” She said that the video praises the heroic Communist Party “In one Canadian Confucius Institute, students were taught to sing songs that incite hatred towards the Communist Party’s enemies,” she said. Canada’s largest school board has shown the door to the Beijing-run Confucius Institute. Confucius Institutes had offered propaganda videos as teaching materials for children.